The 2015 calendar that was part of the C87 Set on sale at Comic Market 87! Includes characters spanning the history of Nitroplus CHiRAL games, from "TOGAINU NO CHI" to "DRAMAtical Murder!" ・This item was one of the products included in the "Nitroplus CHiRAL C87 Set." 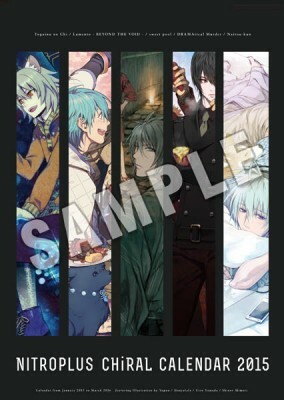 The "Nitro+CHiRAL Clear File Set" will not be available for future purchase. This product will not come with the "Thank You Illustration Paper" bonus offered at the event.